So, everybody knew that when the free agency started yesterday morning, the Brooklyn Nets were going to be at the center of it. (After all, they only have four people on their roster.) But, boy, they're pretty much running everything right now. Even stuff they don't really have much to do with. Seriously, it's madness with the Nets. Every free big name in the NBA, it seems (as well as some guys who aren't free agents), has some sort of connection with the Nets. Let's break down each guy and where everything stands. Dwight Howard. Man, this guy. So, the minute the Nets started working on some other business not involving Dwight Howard — needing to fill out a roster and all, nevermind the fact that Howard just signed for another year with Orlando when he didn't have to — he's causing a whole big fuss again. He has made it clear that he'll only sign a contract extension with one team, and that team is almost certainly the Brooklyn Nets. (A team that has only four other players, we remind you, in case you were wondering whether this was a basketball decision or a business decision.) The Magic have no obligation to trade Howard to anyone in particular, but they could certainly get more back if their trade partner knew he'd re-sign. But then again, this is Dwight Howard: Who freaking knows what whim he'll go off on next. The Nets are busy moving on, trying to build a team. Howard is still a great player, but he's under contract to another team (a decision he made, by the way), and there's really not much the Nets can do right now. Not that Howard's not going to dominate every conversation anyway. Joe Johnson. It was just two years ago that Johnson was the lame minor superhero on the same free-agent team as the Justice League of LeBron James, Chris Bosh, and Amar'e Stoudemire. The Hawks signed him to a max contract everyone knew they'd end up regretting, and they regret it. Thus, the Nets are looking to get in on that action, and they've got a great chance, if they really want him, because few other teams can take on that contract. The Nets would have to trade extremely little to get him, which, actually, is a reason to be wary of the trade. That said, Johnson can still score, and a Deron Williams/Johnson/Gerald Wallace 1/2/3 wouldn't be the worst thing in the world. No Dwight Howard, though. Steve Nash. Nash is a backup plan for the Nets, but he's a legitimate one, and they apparently met with him this morning. The Raptors are still considered the most likely landing place for Nash, because they're in Canada and because they're offering a crapload of money. (Three years!) Nash, if he's gonna work in the metro area, is said to prefer the Knicks anyway, but we don't really see that happening. It's nice that everybody's meeting, but Nash is gonna be a Raptor, we're guessing. 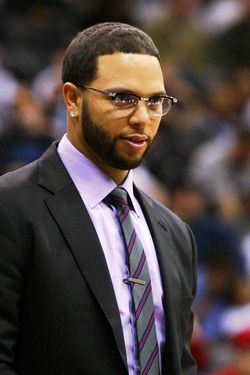 Deron Williams. And, the guy it all comes down to. The Nets met with him this morning as well, and all told, they're said to be increasingly confident in re-signing him. They really can't get moving on anything else until they nail down Williams. The scuttlebutt says that Williams is likely to decide by July 4 — brats and Roman candles are more fun when you have your mind free of business woes — and we're nearing the point that it would be a bit of a shock if Williams didn't re-sign with the Nets. Which is a good thing, because if he doesn't, so much of this is for naught: Then the Nets are just Gerald Green and Marshon Brooks and a shiny new building with no one to fill it.